When replacing wheels, care should be taken to ensure that they are equivalent to those removed in load capacity, diameter, rim width and inset*. *: Conventionally referred to as "offset". The wheels of your vehicle are equipped with tire pressure warning valves and transmitters that allow the tire pressure warning system to provide advance warning in the event of a loss in tire inflation pressure. Whenever wheels are replaced, tire pressure warning valves and transmitters must be installed. Do not use wheels that are a different size from those recommended in the owner's manual, as this may result in a loss of handling control. 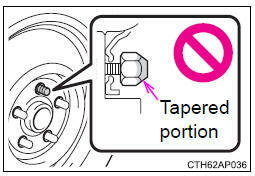 Be sure to install the wheel nuts with the tapered ends facing inward.